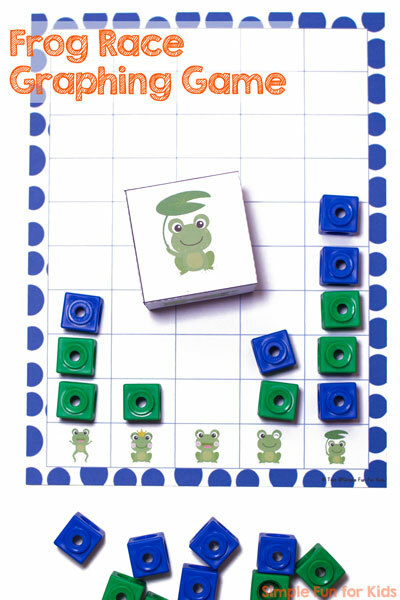 Today, I have another printable graphing game for you: Frog Race Graphing Game! These games are just so much fun – and simple too! 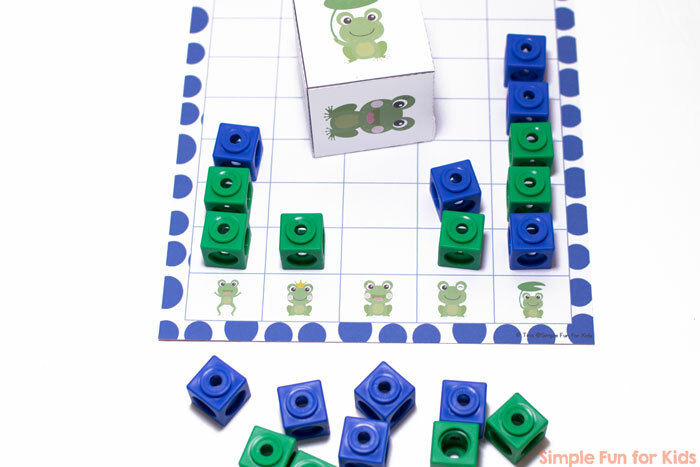 You can work on basic math concepts and taking turns with a quick game that doesn’t take long to set up or play. Great for preschoolers and kindergarteners! Glue stick to put the custom die together. Two of the pages of the printable need to be printed: The game board and the custom die template. There are five different cute frog images: Jumping frog, frog princess, laughing frog, winking frog, and frog holding a lily pad. The die shows the five frog images on five sides and a lily pad with the words “Roll again!” on the sixth side. Print die template and the game board on heavy paper or cardstock. Cut out the die template at the black lines. Fold at the dashed lines, add some glue to the tabs, and put the die together. Add some manipulatives to play the game. We used Mathlink Cubes this time, but you can use pretty much anything you have on hand. To play the game, roll the custom die and record your rolls by covering a square on the game board with a manipulative. If you prefer, you could use markers to color the squares instead. Talk about which frog is in the lead or lagging behind. Who’s catching up quickly? Count how many times you’ve rolled a specific frog image. Will the outcome be different next time you play this game? Why? 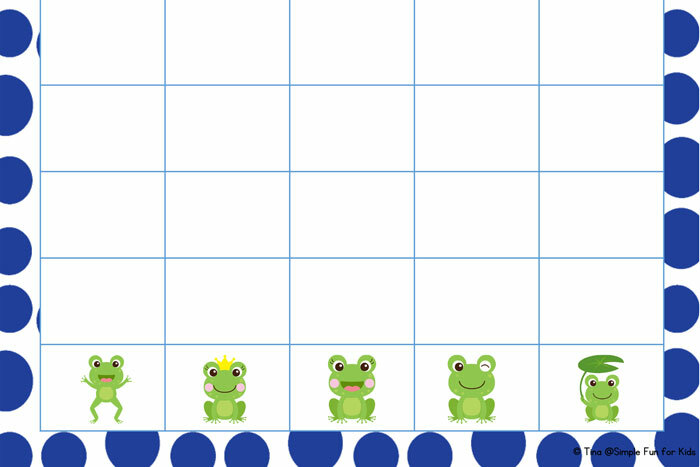 Download your Frog Race Graphing Game!